Welcome to our blog post on one of our most absolute favorite topics… READING! When we started teaching, we couldn’t wait to share our love for reading with our students. We set up our classroom library, had 30 minutes devoted to silent reading each day and assigned reading for homework with students writing a summary of what they read. We even took our students to the school library every week so that students could find books they would enjoy. Here’s what we quickly discovered… our students did not enjoy reading! Looking back now, we don’t blame them! Ahhhhh!!!! Looking back now, we could scream!!!!!!!!!!!!!!!! Our little readers were basically having reading ruined for them! We had the best intentions, but we went about it all the wrong way. Students had their reading time confined to a 30 minute block of time with no purpose, follow up, sharing, discussion, etc… It was simply: open book, read, close book. Go home. Open book, read for 20 minutes (maybe) and then write a half page summary. Go to the library, return books that they might not have even finished, and get a new book that they may or may not actually read. YUCK! TORTURE! Readers need excitement! Students need to be able to talk about their reading and share their reading with others! Readers need a contagious reading environment that fosters a love for reading, makes reading fun and makes reading a part of who they are! Reading should not be an activity that only exists in a 30 minute block of time at school. Readers need to be able to read throughout the day and should be encouraged to squeeze in extra reading time whenever they can! NOOOO!!!!! You are torturing your students and giving them anxiety about reading! Students view this type of reading as a long period of time that they have to sit still for, a way they could get into trouble if they don’t write a summary or book report, and a time of the day that brings anxiety! What teachers “need” is the part of reading that students dread the most! Readers bloom in an environment where the teacher is excited about reading themselves! Show your students that you love reading too by reading yourself! Talk about your reading with your students and always be ready to give recommendations to students! Show your readers that reading continues even outside of the classroom! Readers should always choose books that interest them! Students should look for recommendations from you and other students in the classroom. They need time to discuss their reading with each other and create a Books to Read List! The buzz in the classroom should be about what they are reading or what they are going to read next. This is the piece that should perk your little ears right up. Accountability. This is the part that teachers are looking for in their classrooms. Accountability is the proof that students actually read the book they said they did. This accountability piece should be the most fun part! There are so many ways for students to prove they read! One way is just through a discussion! Students can discuss their reading with you, peers, or family! If you take the time to listen, you can quickly see if a child has actually read a book or not. The accountability piece should be short, fun and meaningful in order to foster a love for reading in your students. What do students enjoy more than anything else? If you answered social media, you are correct. We strongly believe in capitalizing on students’ interests and bringing them into the classroom to “trick” them into loving whatever it is we are teaching. To us, reading is our number one priority, so we saved our students’ top interest just for reading! Students love Instagram. They love posting pictures and selfies, using hashtags, creating fun usernames, following their friends, commenting on posts and scrolling through other accounts. If we told you that students could do all of this with their reading, would you believe us? Our Instagram Reading Challenge is the answer! When you hear the term Reading Challenge, it can turn a lot of teachers off. Here is our Challenge to our students: “How many books can you read this year?” That’s it! It’s that simple! There are no rewards, there are no prizes, there are no fancy awards. The reward for students is that they get time to spend inside books and then the opportunity to share their reading with their peers in a fun and engaging way. As educators, we all really know that the real prize is reading… and being turned into a lifelong reader! Students start the fun process of their Instagram Reading Challenge by setting up their accounts. Students use file folders and glue in the template that they will use throughout the year. There are sections for directions, followers, posts, books to read lists, and even a graffiti wall for awesome quotes! These file folders are a working document that students will use all year long to collect their reading memories in your classroom. Students get to post to their Instagram Accounts when they finish a title. You can simply have students write the title, or they can gain some computer skills by copy/pasting their book’s cover into a Word Document. We used four computers for this. When students completed a book, they popped onto one of these computers and added their cover to the document. We printed out the covers once a month and students gathered their covers and glued them into their account. We loved this process because it created excitement and even another time when students got to share their completed books with each other. Students also assign “Likes” to the title based on how much they enjoyed the book. We like to have them use a range of 1-100 for their “Likes.” This large range allows students some room to gauge their enjoyment of a book. Check out how our students copy/ pasted their covers! Super quick and fun! In our classrooms, we choose to have students collect the titles they read over a month’s period of time. We have found that students usually will read four books in this amount of time. At the end of the month, we have students “share” the book that received the most likes that month. There are a variety of activities that we have students complete. They can post a picture of the main character, setting or most exciting part, create a commercial, describe emojis for the book, list hashtags for the book, make a sponsored ad, or invent a series of comments between characters! All of these activities are high interest activities that will have students excited to complete. These engaging activities also serve as a way for you to see that students are actually reading in your class! We love the idea of creating a huge Instagram Reading Challenge bulletin board to add to the excitement! We post our Class Read Aloud books to our account and have students vote on the amount of likes for each book. This is a great conversation piece when parents come into the room and a great way to look back at our loved books throughout the year! To celebrate our reading and to have some social media/ reading fun, we throw a Selfie Party for all of our readers. You can have this be an incentive to reach a certain number of books, or just a fun time to capture your students’ love for reading. We love using props, books, and smiles to show off the fact that we are a reading classroom full of lifelong readers! We Love Spoiling our Subscribers! Get this fun Instagram Posting Activity for FREE! It is the perfect activity to go along with this engaging theme! Click here for this Instagram Reading Challenge! Whether or not you think this Reading Challenge would be a good fit for your classroom, our hope is that you have gained some tools and tips to use in your classroom that will create a positive reading environment for your students. Students need a reading role model, a plethora of high interest books, time to read, and meaningful ways to share their reading. We would love to hear about how you foster a love for reading in your classroom! Challenging Your Students to Read!!!!! Trying to get students to read can be difficult and trying to get students to LOVE reading can be even more difficult. We all know that the number one way for students to improve in all areas is through READING! My fourth grade partner teacher and I came up with a strategy that we LOVE and better yet… our students LOVE it! So here’s the break down…. students 5-8 days to complete. Books- The nonfiction books are not necessarily chapter books. We love using the Eyewitness books. Again, we read one aloud while the students read one independently. Let’s say that we are learning about Rocks and Minerals and are required to teach nonfiction text features. We model how to distinguish one text feature from the next, while they practice independently in their own book. Nonfiction books usually take students 4 days to complete. Mythological Allusions! Traditional Literature books usually take students 3 days to complete. Choice Chapter Books- This is exactly what it sounds like! Students will choose a chapter book of their choice at their own level… you will be surprised how many choose the second book of the series that you read for your read aloud!!!! We can never keep these books on our shelf! Free choice chapter books usually take 5-8 days to complete. the breakdown of days above, you can see that most students finish their 4 books in just 23 days. That leaves plenty of time for slower readers and allows more time for advanced readers to read more books of their choice, which we call Extra Credit Books! 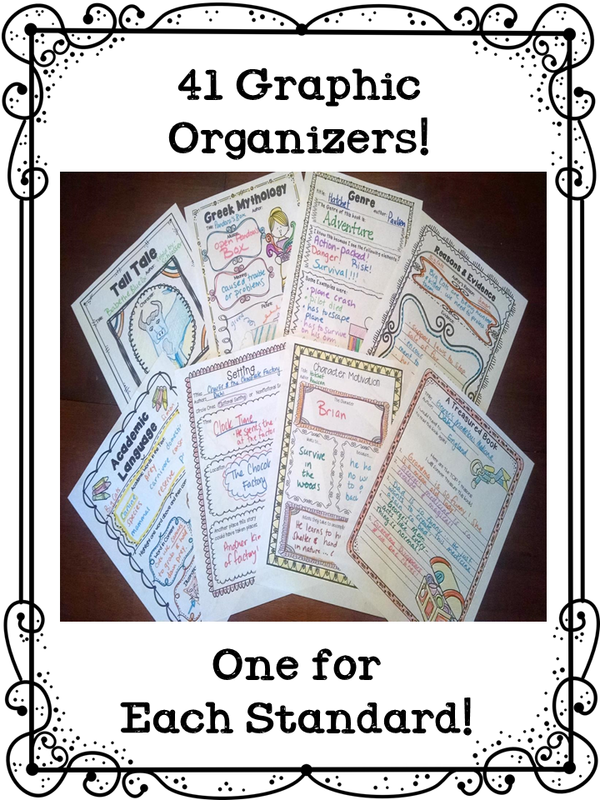 We have created 41 graphic organizers… one for each standard with several generic graphic organizers for teachers to use throughout the year for their Golden Packets. Each golden packet is customizable to EXACTLY what you are teaching! So what makes students want to read 40 books over the course of the year? I’m glad you asked! We have developed an incentive program that motivates students with many short term goals and rewards that MOST IMPORTANTLY doesn’t cost the teacher a penny! We have developed a game board that is in a lap book format. Each child has a file folder with a game board inside where they track how many books they have read. At the end of each month, students who have proved that they have read their 4 books (by turning in the Golden Packet), get the chance to compete against other students who have also met their goal for a reward coupon. Students who complete their books are given a reward certificate. With this certificate, they get to compete in a different game, such as Battleship, each month. All game rules and materials are included! The winner of the game gets to choose from 20 reward coupons, such as “Teacher Answers One Problem on an Assignment.” These coupons have been included! Below is a picture of the reward coupons. We store them in baseball/trading card pages and hang them on our walls. 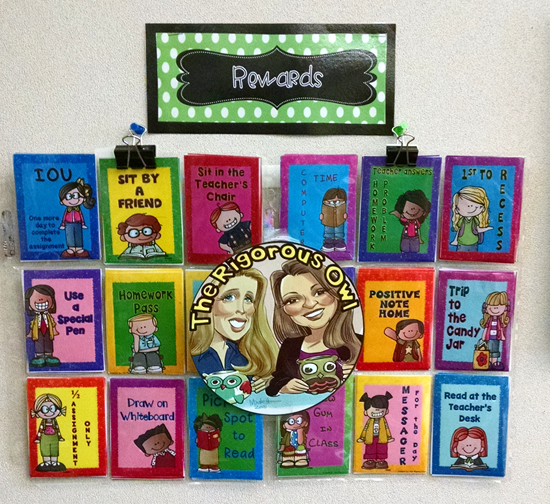 Students love to look at them and choose which coupon they want to work toward earning! But what about the student who was 3 days late in completing their book or just never did???? There is an incentive program for them too! If students complete their books late, they are given a “Slow but Steady Also Wins the Race” reward coupon! They turn these certificates into a raffle jar and you can choose when to draw names for reward coupons as often as you would like! Also included in this product is a bulletin board! The bulletin board is made up of a small bookshelf for each child. When students hit one of the goals, such as 8 books, they get to cut out the “8 Book Goal” book, color it and glue it onto their bookshelf. This provides you with a bulletin board that lasts you ALL YEAR LONG and best of all requires NO WORK FROM YOU to maintain! The bulletin board is also another incentive to have students want to reach their goal! The new reading incentive program that we have implemented at our school this upcoming school year is 30 books for 3rd, 40 books for 4th and 50 books for 5th. Our entire upper grade has taken on this reading challenge! There are variations to the game board from what is mentioned above. The genre book is taken out for 3rd and Poetry is added in for 5th. If that doesn’t suit you, a blank game board is also included so that you can use any combination of books you would like! To wrap it all up, students are reading 80 books in one year, they get to play games, they earn rewards that don’t cost you a thing, and you are provided with an amazing bulletin boardthat lasts you all year long. What’s not to love… besides reading?!! Get the 40 Book Reading Challenge HERE!!! 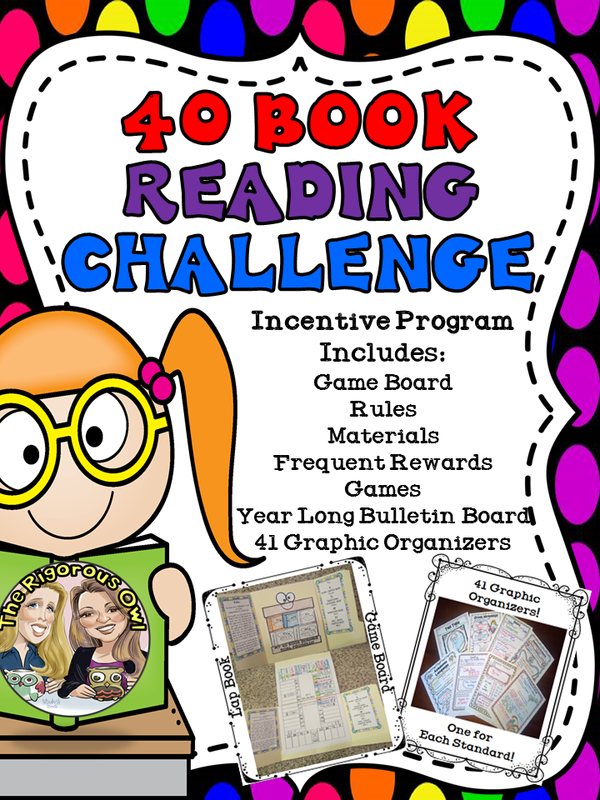 Get the 30 Book Reading Challenge Incentive Program HERE!Get the 50 Book Reading Challenge Incentive Program HERE!